Dactyl is a natual satellite (moon) of asteroid 243 Ida. 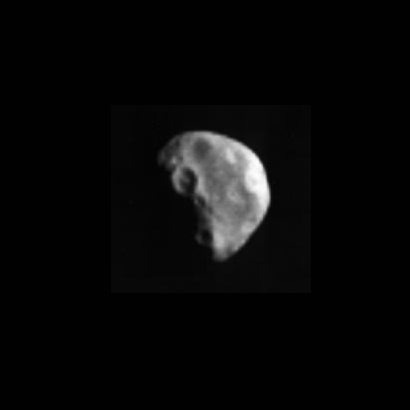 Dactyl was the first moon found orbiting an asteroid. NASA's Galileo spacecraft discovered the tiny moon during a 1993 flyby of Ida while en route to Jupiter. More than a dozen craters larger than 80 meters (250 feet) in diameter are clearly evident, indicating that the moon has suffered numerous collisions from smaller solar system debris during its history. The larger crater on the terminator is about 300 meters (1000 feet) across. Dactyl is approximately egg-shaped, measuring about 1 mile wide.